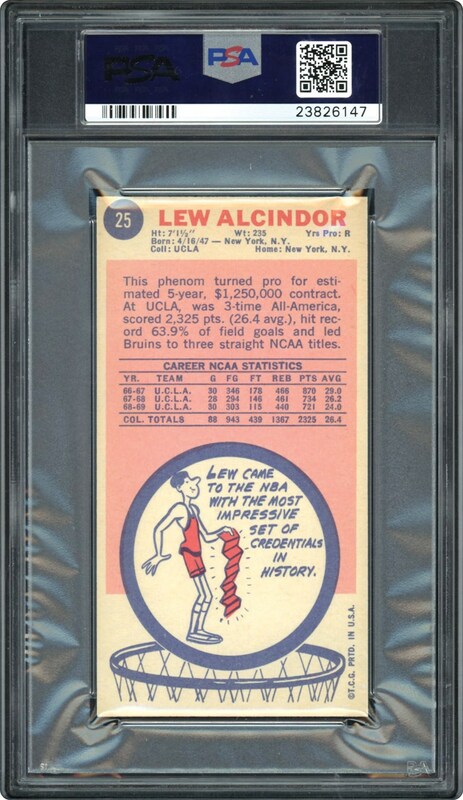 Lot # 107: 1969 Topps #25 – Lew Alcindor Rookie Card (PSA Mint 9) - Only 2 Graded Higher! 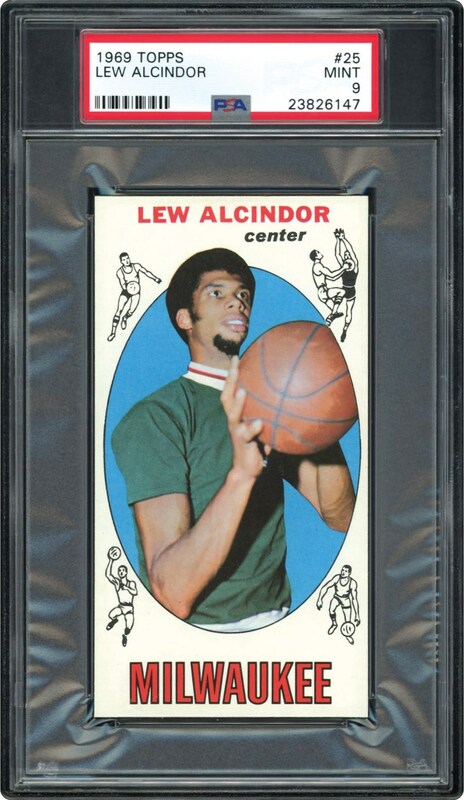 This breathtaking 1969 Topps PSA Mint 9 Lew Alcindor Rookie Card gem resides as one of the most significant cards in the basketball collecting community. Of the 2,500+ PSA encapsulated copies, only 17 specimens exist at this hallowed plateau (a microscopic 0.7%) with a paltry two examples graded higher. A bona-fide testament to his career, it was issued before Lew Alcindor changed his name to Kareem Abdul Jabbar, and resides as the perfect cardboard keepsake for his magnificent career. Alcindor's 38,387 points (24.6 PPG) still stands as an all-time NBA record, with his 17,440 rebounds (11.2 RPG) and 3,189 blocked shots (2.5 BPG) both ranking #3 in NBA history. He played in a record 19 All-Star games, won 6 MVP awards and claimed 6 NBA titles, 2 of which he was voted the NBA finals MVP! Arguably speaking, other than Wilt Chamberlain, Michael Jordan and Oscar Robertson, no NBA player can statistically compare to Jabbar's uncanny achievements, substantiating his status as one of the five greatest all-time NBA players. Likewise, this "1 of 1" oversized rookie card masterpiece boasts near-perfection, easily meriting its stratospheric "Mint 9" assessment. The brilliant Alcindor image portrays this irrefutable icon in a shooting position, basketball in hand, as he is about to score another two points. The illustration depicts sparkling hues, near-perfect right- angled corners, a snow-white background and pristine-like surfaces. Pack-fresh in every conceivable way, this inaugural Alcindor rookie gem resides as one of the most significant basketball cards extant, and a sheer reminder of the near-perfection Kareem Abdul-Jabbar achieved so many times on the hardwood court throughout his storybook career!